Aromatic Amines and Heterocyclic Nitrogen Compounds. 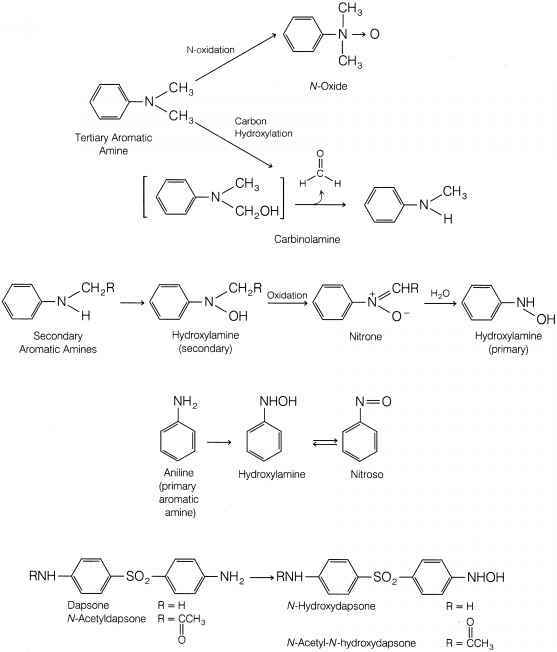 The biotransformation of aromatic amines parallels the carbon and nitrogen oxidation reactions seen for aliphatic amines.221-223 For tertiary aromatic amines, such as N,N-dimethylaniline, oxidative N-dealkylation as well as N-oxide formation take place.224 Secondary aromatic amines may undergo N-dealkylation or N-hydroxylation to give the corresponding N-hydroxylamines. Further oxidation of the N-hydroxylamine leads to nitrone products, which in turn may be hydrolyzed to primary hydrox-ylamines.225 Tertiary and secondary aromatic amines are encountered rarely in medicinal agents. In contrast, primary aromatic amines are found in many drugs and are often generated from enzymatic reduction of aromatic nitro compounds, reductive cleavage of azo compounds, and hydrolysis of aromatic amides. N-oxidation of primary aromatic amines generates the N-hydroxylamine metabolite. One such case is aniline, which is metabolized to the corresponding N-hydroxy prod-uct.223 Oxidation of the hydroxylamine derivative to the nitroso derivative also can occur. When one considers primary aromatic amine drugs or metabolites, N-oxidation constitutes only a minor pathway in comparison with other biotransformation pathways, such as N-acetylation and aromatic hydroxylation, in humans. 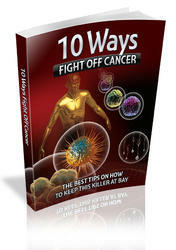 Some N-oxygenated metabolites have been reported, however. 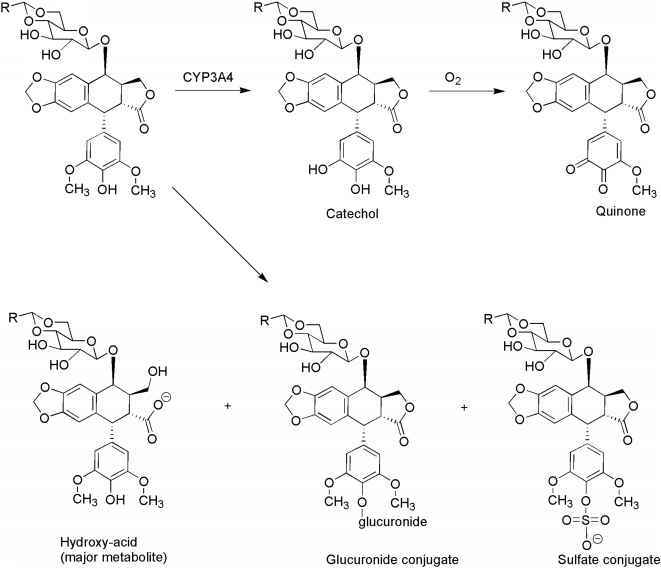 For example, the antileprotic agent dapsone and its N-acetylated metabolite are metabolized significantly to their corresponding N-hydroxylamine derivatives.226 The N-hydroxy metabolites are further conjugated with glucuronic acid. 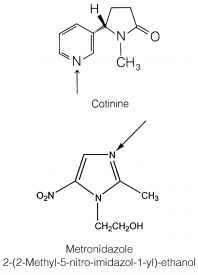 Diverse aromatic amines (especially azoamino dyes) are known to be carcinogenic. N-oxidation plays an important role in bioactivating these aromatic amines to potentially reactive electrophilic species that covalently bind to cellular protein, DNA, or RNA. A well-studied example is the carcinogenic agent N-methyl-4-aminoazobenzene.228'229 N-oxidation of this compound leads to the corresponding hydroxylamine, which undergoes sulfate conjugation. Because of the good leaving-group ability of the sulfate (SO42_) anion, this conjugate can ionize spontaneously to form a highly reactive, resonance-stabilized nitrenium species. 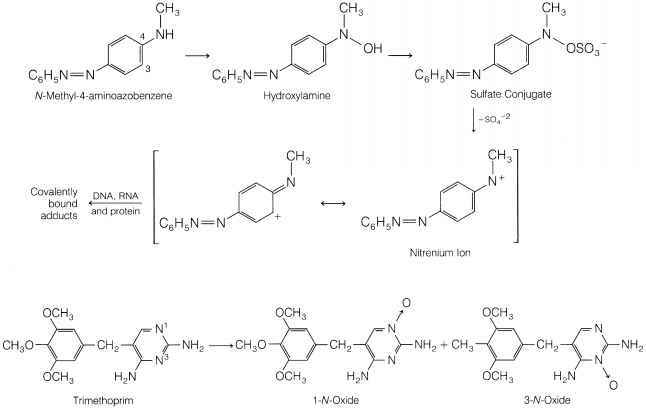 Covalent adducts between this species and DNA, RNA, and proteins have been characterized.230,231 The sulfate ester is believed to be the ultimate carcinogenic species. Thus, the example indicates that certain aromatic amines can be bioactivated to reactive intermediates by N-hydroxylation and O-sulfate conjugation. Whether primary hydroxylamines can be bioactivated similarly is unclear. In addition, it is not known if this biotoxification pathway plays any substantial role in the toxicity of aromatic amine drugs. Various other N-alkyl substituents present in benzodiazepines (e.g., flurazepam)136-138 and in barbiturates (e.g., hexobarbital and mephobarbital)128 are similarly oxidatively N-dealkylated. Alkyl groups attached to the amide moiety of some sulfonylureas, such as the oral hypoglycemic chlorpropamide,236 also are subject to dealkylation to a minor extent. methylbutyramide chemotherapeutic effect. Enzymatic oxidation of 4-hydroxy-cyclophosphamide and aldophosphamide leads to the relatively nontoxic metabolites 4-ketocyclophosphamide and carboxycyclophosphamide, respectively. N-hydroxylation of aromatic amides, which occurs to a minor extent, is of some toxicological interest, because this biotransformation pathway may lead to the formation of chemically reactive intermediates. Several examples of cytotoxicity or carcinogenicity associated with metabolic N-hydroxylation of the parent aromatic amide have been reported. For example, the well-known hepatocarcinogenic 2-acetylaminofluorene (AAF) undergoes an N-hydroxyl-ation reaction catalyzed by CYP to form the corresponding N-hydroxy metabolite (also called a hydroxamic acid).241 Further conjugation of this hydroxamic acid produces the corresponding O-sulfate ester, which ionizes to generate the electrophilic nitrenium species. Covalent binding of this reactive intermediate to DNA is known to occur and is likely to be the initial event that ultimately leads to malignant tumor formation.242 Sulfate conjugation plays an important role in this biotoxification pathway (see "Sulfate Conjugation," for further discussion). 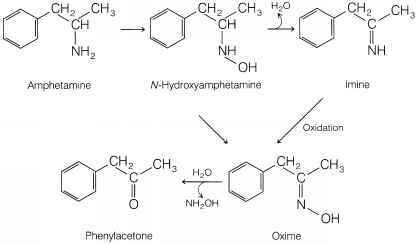 Spontaneous dehydration of this N-hydroxyamide produces N-acetylimidoquinone, the proposed reactive metabolite. Usually, the GSH present in the liver combines with this reactive metabolite to form the corresponding GSH conjugate. If GSH levels are sufficiently depleted by large doses of acetaminophen, covalent binding of the reactive intermediate occurs with macromolecules present in the liver, thereby leading to cellular necrosis. Studies indicate, however, that the reactive N-acetylimidoquinone intermediate is not formed from N-hydroxyacetaminophen.245-247 It probably arises through some other oxidative process. Therefore, the mechanistic formation of the reactive metabolite of acetaminophen remains unclear.